Hope this mixed tenses exercise can help. I often find it difficult to get mixed tenses exercise. It´s actually for elementary level but you can give it to advanced level too. I made this text from one of the units that I´ve written for my book. I hope it´s okay. I also gave this exercise to my students. 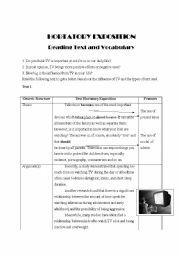 It´s about hortatory exposition; the examples of texts, vocabulary exercises and also the answer key. Hope it´s useful for you. Thanks and enjoy! 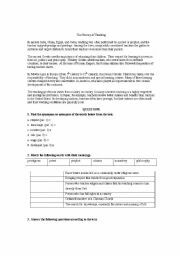 It´s a grammar test I made for my students. 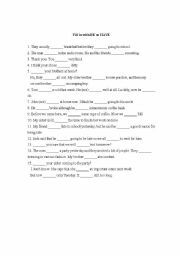 It´s a mixed grammar exercises; tenses, grammar, pronouns, adverbs, etc. It´s suitable for 6th-8th graders. Hope it´s also useful for you. Thanks and enjoy! Its a test for my students, mixed of readings and grammar practice so they can revise their work and not forget about their previous lesson. Hope it´s useful for you too. Thanks and enjoy! This is a unit I made for publishing and for my students. 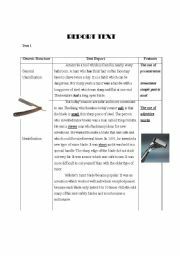 It´s about Report text and there are some exercises about the vocabulary as well. There is also grammar part in the second part. I have to upload the answer key separately because it is said that the file is too big. Hope it´s helpful. Enjoy! I give this exercise for my students in 6th and 7th grades, and they like it. This reading is intended for advanced students, to make them more familiar with vocab and also train them to write.